It was 3:00 AM and I couldn’t sleep. I had gone to bed the night before, skipping the Yankees’ game, with the hope that the early evening drowsiness would translate into some solid rest. I managed a to get a few hours in, but, by the time that the clocks rolled back at 2:00, I knew my tossing and turning had become annoyingly obvious. Now, having held myself down for as long as I possibly could, I decided to get my day started. I had known the pain of the marathon before. It is a grueling test of physical endurance and mental toughness. Certainly there were “easier ways” to raise money for missions–ways that didn’t require months of preparation accompanied by the sacrifice of the ones I love most. At the same time, I knew of no other fund raising method that spoke of the total commitment that is the call to missions. I knew as well that pain, as I mention in this post, has a way of forming us and shaping us in ways no other experience can. While I didn’t look forward to the pain this day’s marathon would certainly bring, I knew that persevering and pushing through it would bring personal growth I couldn’t experience otherwise. After I finished my breakfast, I took to the task of finalizing the preparation that I had made the night before. Race number, check. timing chip, check. Energy gels, check. I made coffee for Kelly who made sure the kids were up and ready for the ride to the starting line, and we were off. Kelly dropped me at Bass Pro, the outdoor store here in Springfield that served as the headquarters for the event and returned to feed the kids while I took in the pre-race service that the coordinators had offered. Pastor Mark Zimmerman encouraged us to “enjoy the change” that running had brought and gave us three trustworthy sayings to keep in mind. “Be smart from the start. 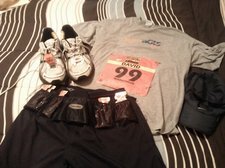 Break through barriers, and go the distance.” Each phrase is vitally important to marathoners as we face the unique test that 26.2 miles presents, but also to Christians as we continue on our spiritual journey. With the service over, there was the trip to the facilities, which, unlike past marathons wasn’t as urgent or frequent. I had cut out milk the day before, and limited my calories. Instead of gorging on pasta, I had a normal dinner which included sweet potatoes, my secret source of power. The result was a much calmer 30 minutes before the start. On the way to the bag check before my trip to the starting line, I got a chance to connect with a good friend, Joel Maxwell. 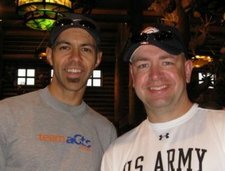 He was running the marathon 9 years after being run over while trying to question a criminal on the Evangel University campus in Springfield, MO. (You can read his marathon story online at the News Leader website.) We got a quick picture, and then it was outside to get the marathon started. In the parking lot where the race was to start, I warmed up a bit to get my legs ready for the 8:10 pace that I was planning to run. Then we were called in to take our places. I lined up with the 7:00-8:00 pace per mile runners as we bowed our heads for the invocation and then stood at attention for the National Anthem before the count down from 10 for the marathon. Then, we were off. I abruptly found that I had lined up a bit too far in front as a sea of humanity rushed past me in the first half mile. I was tempted to be carried along with the crowd, but the understanding that the majority of the starters were only running the half marathon and the digital companion, Garmin, on my watch told me to hold back. My plan was to run nice and easy for the first 10, concentrate on holding my pace for the second ten, and then evaluate and determine whether to attack the last 6.2 or to just hold on for the finish. 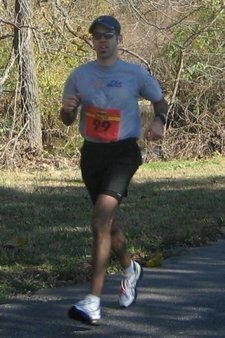 Looking for a pacing partner, I fell into step with Brad Kielhofner, an employee for Missouri State University. He was shooting for an 8:15 pace. 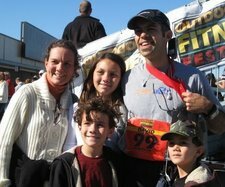 We chatted for the next 10 miles about our marathon experiences our family, and our faith. Running with Brad also garnered me some additional support as it seemed that at each bend in the road there were people that he knew cheering him on. The course up to mile 4 was fairly flat and fast. By this time we had diverged from the street onto the greenway that runs parallel to Lone Pine Avenue in the southeast section of Springfield. At one point, this trail passes below Battlefield Road, a major thoroughfare through a culvert that had been converted to handle pedestrian access. With all of the rain in the recent weeks, the creek that runs through the culvert had flooded a portion of the pedestrian tunnel. Though the water might not have been more than an inch in depth, even high stepping wasn’t enough to keep our feet dry. The dampening experience was short lived, however, as I was greeted by my own cheering section as I emerged from the tunnel. 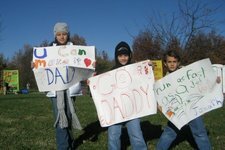 At home, Kelly and the kids had fashioned their own signs and they were yelling their support for their marathoner. Their encouragement helped me forget about the water seeping through my shoes and press on, knowing I’d see them throughout the course. In fact, they were also at mile 12, 15, 21 and 23 before hustling to greet me at the finish. After the first ten miles, I said goodbye to Brad and began to pick up the pace a bit in order to stay in stride with my digital companion. Along the way, I ran with Dink Sommer, a Joplin resident, who was looking to run a 3:40 marathon. I also got a chance to see Norma Garnica (a first-time marathoner running for God4Girls), Mike McCreary (the young adults pastor from Central A/G) also a first-timer, and Joel again as several switch backs had runners from all paces greeting one another on the trail. A bathroom break had me fall off pace for a bit, but I was steadily making up ground and pulling even with Garmin, my digital friend, by mile 21. 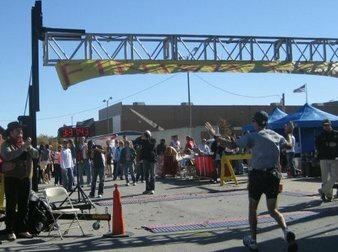 Here though, the marathon began to take on its familiar humbling personality. Now snaking through the southeastern portion of Springfield, the marathon course passed close to more low water crossings. At various points, the trail was flooded with no easy path to avoid a soaking. Also, the marathon began a steady climb, from the lower trail portion of the race to the city streets ascending back to Bass Pro Shops. All of this, coupled with the miles I’d already run, took their toll as my pace steadily increased from 8:10 per mile to 8:30, eventually to a 9:30 pace. This is what is known as the wall, where fatigue and pain rear their ugly heads. This is point in the race where your body tells you to quit and every step becomes a matter of will. By mile twenty-four my mantra had become, just 20 more minutes, Dave, you can hang on until then. We passed over a bridge, then into the neighborhood behind Bass Pro. The course turned, then turned again. With each turn, I looked ahead for signs of the finish line approaching, but was greeted by only one tree lined street after another. The spectators were absent, the volunteers, having worked now for hours, noticeably silent. Still, I labored on, each step seemingly slower than the last. I was sure that Garmin, his digital legs unaffected by the distance, his virtual feet untouched by the dampness, was laughing at me now nearly a half mile in front. Still, out of the fog that had become those last few miles, the finish line appeared. I heard the music. I saw the spectators, and I then they announced my name. I was finishing! I crossed the finish line with the last of the energy that I had. I was spent, but it was worth it. I had crossed the line at 3 hours, 37 minutes and 52 seconds, a personal best by nearly 12 minutes! My only thought was to see my family. I passed around the barriers and through the crowd to find them. Hugging them brought closure to a year-long journey of running this marathon. We had done it together. This was a team accomplishment. So as Oswald Chambers’ words seemed to prophesy, I had experienced pain, but I hadn’t collapsed. I hadn’t sat down. I had labored on. On the way, I’d met some great people and shared in some great stories. All of us overcoming, all of us breaking through barriers, all of us growing through the momentary suffering that is the marathon. Congrats on your Marathon PR- it's amazing!! Great report thank you for sharing! Blessings. I'm glad to share it with you. You did pretty amazingly yourself. 4 hours, and your first time! Have you thought yet of when you'll run your next? Dave, glad you made it to the finish line, and in good time. May we all finish the race that G-d has set before us, as this video can represent our race, some of us will stumble & fall, but by His grace, His word, His love, His mercy, His strength, we can make it!!!! May we all run the race that He has set before us with perseverance!! Great video, Mom! Thanks for the encouragement. Dave, this is an absolutely great story and accomplishment. Thank you so much for sharing it. You are to be admired! You’re welcome. Really though, I have to give credit to everyone, my supporters and especially my family, who sacrificed lots of hours of training time to get me to the starting line. Hey, that's my "secret source of power." Well I guess it's not secret anymore since I spilled the beans… or was that the potatoes?